In November, 2014 we discovered that our three-year-old daughter, Grace, has a rare genetic disorder called INAD (infantile neuroaxonal dystrophy). This blog is dedicated to our little girl and the journey that we are on. We stood in the middle of the court in the Hillsboro High School gym tonight, and I couldn't help but tear up a little as the entire crowd stood up in support of our little family. It was our first-ever standing ovation. In my high school days, I was never an athlete in that gymnasium. I never took the court for the volleyball or basketball teams. I did play tennis all four years, although it's safe to say I was not much of a star athlete. However, Kyle once dug out my MVP trophy from my senior year and put it out on our piano as our family's greatest sporting achievement. I think he's pretty proud of it. Grace and I cheering for the Hiltoppers in tonight's game! But tonight was different. Before the start of the game where the Hillsboro Hiltoppers took on the Southwestern Birds, the announcer invited us to midcourt for a special presentation. The five Topper seniors brought Grace a basketball, signed by all the players and coaches, and Coach Vanzo presented us with three team t-shirts from this season. Fittingly enough, their motto this year was "Finish the Journey," and they wanted us to have them. Then, it was Grace's turn to shine. Senior Dylan Miller took her to the rim, as the other seniors held the ball up for her. 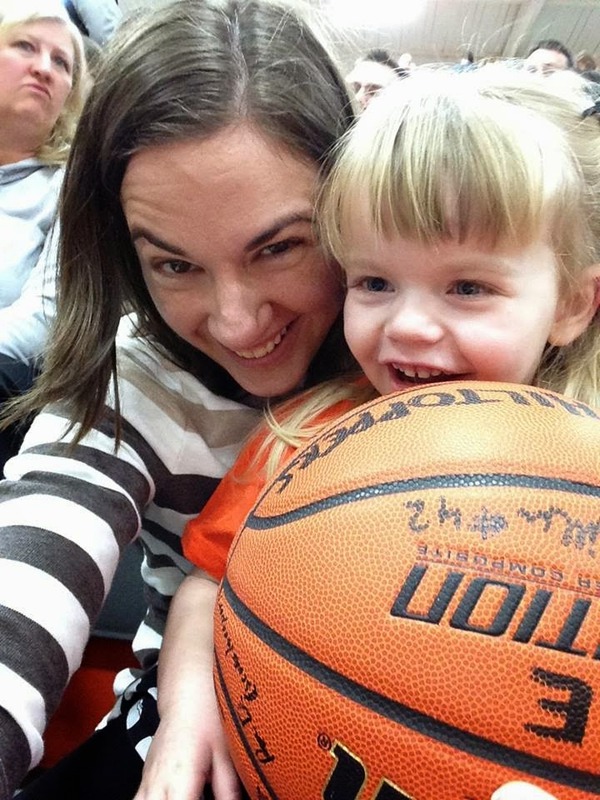 She wasn't quite tall enough to get the ball into the rim, but the crowd erupted in cheers just the same. The senior Hiltoppers (from the left, Cody Caulk, Dylan Miler, Dylan Gray and Brenden Meier - not pictured is Koby Lemon) gave Grace her chance to slam dunk before the start of the basketball game. Although we hope and pray for a miracle with each and every breath we take, we know there's a good chance Grace may never have the chance to attend Hillsboro High School, let alone play sports. It's so humbling the way that our communities have embraced us and surrounded us with love. As we walked off the court, two young boys were talking to each other. One looked up at the other and said, "isn't she lucky?" referring to the fact that Grace got a chance to "play" ball with the seniors. It's kind of ironic that he thought she was the lucky one, considering she may never be able to walk or talk. Held up by the Toppers, Grace gets a chance to make a "slam dunk!" However, as we stood in the middle of the gym tonight, looking up at an entire gymnasium full of people standing up for our Grace, we know that's true. She's truly the lucky one. Lucky to be surrounded by family, friends and communities that love and support us. Lucky to have the chance to go to preschool with her friends. Lucky to have therapists taking such good care of her (and of her mom and dad too). And lucky that God chose her to carry such an important message about learning to enjoy life one day at a time. And that's what you call a real slam dunk.